From the age of three to six, I lived in the French sector of Occupied Germany. One day sometime during that time frame my Mother started to hand me an orange with “ISRAEL” stamped on it in a purplish blue color, but then changing her mind she hesitated, holding it for me to see as she spoke very seriously to me, eye-to-eye. When done she handed me the orange, walking away to continue her day, but all I could do is stare at that orange. Should I eat it, or put it on the shelf in my room? Mom’s lecture was serious, and mysterious. I was left with a million questions that I somehow knew never to ask. What does that orange have to do with me? What is Israel? Who is Israel? What does Israel have to do with me? That, one small event set in motion a lifetime quest to understand; who/what is Israel and what that is to me. Never again (ever) was there a discussion about that word “ISRAEL”. The next time I saw that word was in the Church we started attending. Once we moved to the USA (1955) we attended Our Redeemer Lutheran Church, a small dark wood Tyrolean church with small diamond shaped, leaded stained glass windows; in Augusta Georgia. Seeing it made me feel as if back home in Germany! Once a month I would watch Pastor Erdmann Frenk come in our house for a serious appointment with my parents. The very next Sunday was the continuation of the extremely serious as I sat in the pew watching my parents go forward for communion. Being that I was in the first grade, I had no idea what was going on, but whatever it was, it was deadly serious. 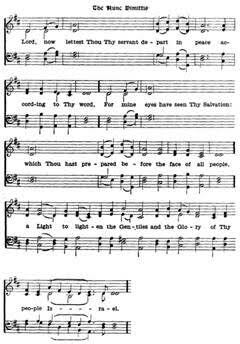 When communion was over we would sing The Nunc Dimittis, (The Song Of Simeon) which I would sing with great joy and gusto because that word, “ISRAEL”, that I first saw in Germany was in that song! Please note that “Is - - - - ra – el” at the very end is drawn out with multiple notes and the organ playing a triumphantly drawn out crescendo.1 You could hear this first grader in the Congregation sing that part for all he was worth! As plain as day, to this day, I remember, even as a first grader questioning why that last verse was split in two “A light to lighten the Gentiles, and the glory of thy people Israel.” I remember thinking: If this guy is the redeemer of the whole world, why does it split into two groups? Imagine my shock when, a year later I discover that those words in the song come directly from the Bible! With that revelation the mystery became deep – very deep – and very personal. All this within two years of coming to America and three years after my Mother’s “orange lecture” in Germany. ”The Orange Lecture” I’m Jewish, but since we are now in “The Church” we are no longer “Jewish” and on top of that I’m not allowed to talk about it. Verboten! Who I am was to be kept a deep dark secret. I wanted to know why “Gentiles” and “Israel” are separated by “and”. If “Jesus” is the redeemer for all, what’s the point?? 25. "And there was a certain man in Urishlim; His name was Shimon. And this man was just and righteous and was waiting for the consolation of Israel. And the Ruach haKodesh was upon him. 26. And it had been said to him by the Ruach haKodesh that he would not see death until he saw the Mashiyach of Master YHWH. 27. He came by the Spirit to the temple, and when his parents brought the boy Y’shua to do on his behalf as is commanded in Torah. 29. “Now dismiss your servant in peace my Master according to your Word. 32. a light for the revelation to the Gentiles. And a glory to your people Israel. "